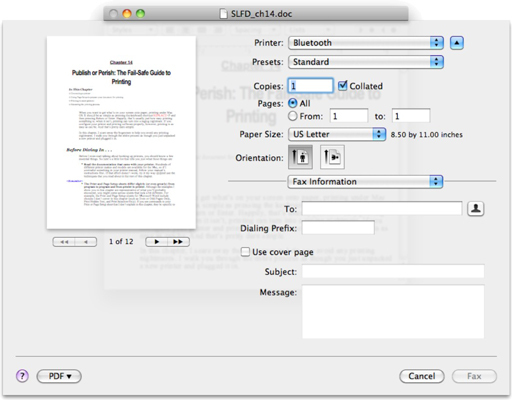 Mac OS X Snow Leopard includes the capability to fax a document right from the Print sheet. But before you can take advantage of it you have to connect and add a fax modem. Fortunately, doing so is as easy as connecting and adding a printer: Just follow the steps you would to install a printer for the first time, replacing the word “printer” with the words “fax modem,” and you’re good to go. After your fax modem is connected and added, all you have to do to fax a document is choose Fax PDF from the PDF pop-up menu at the bottom of every Print sheet. When you do, the sheet becomes a Fax sheet. In Snow Leopard, faxing is just as easy as printing. Choose Fax PDF from the menu that appears when you press and hold the PDF pop-up menu on the Print sheet. Type the fax phone number of the recipient in the To field. If you click the button with the silhouette on the right of the To field, you can select a recipient from the Mac OS X Address Book. Add a dialing prefix if your phone requires one (such as 1, which most U.S. phones require to dial a ten-digit, long-distance phone number). Click the Use Cover page check box if you want a cover page. If you do, you can type a subject in the Subject field and a brief message in the Message field. Select your fax modem from the Printer pop-up menu, if it isn’t already selected. Everything else in the Fax sheet is just the same as in the Print sheet, which you can read all about in the previous sections. Before you fax something, make sure you have a functioning modem and that it’s configured, set up properly, connected to a phone line, and turned on. If you don’t get all those ducks in a row, this whole faxing process will (of course) fail. Note that most Macs sold in the past few years, including all Intel-based models, don’t include an analog modem, so they don’t have built-in hardware that supports faxing; you need to purchase a modem or other hardware to use this feature.